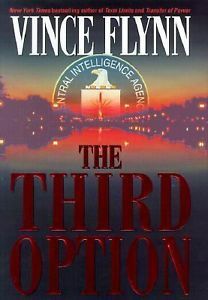 Vince Flynn’s The Third Option, the final book to feature Thomas Stansfield. Mitch Rapp is America’s most beloved assassin, starring in thirteen bestselling novels written by author Vince Flynn. Rapp is an iconic character, but Flynn also had a gift for creating and developing strong secondary characters to put around him. Like any world-class caliber athlete competing in a team sport, it takes multiple skilled players to assemble a championship-caliber team. Rapp benefited from characters such as Irene Kennedy, Scott Coleman, Anna Rielly, Stan Hurley, and Thomas Stansfield – the original spymaster, long before Rapp was even born. Accepting a full academic scholarship to South Dakota University, Stansfield majored in engineering and history, and finished at the top of his class. After graduating, he landed on the radar of William Donovan, largely in part because of his ability to speak three languages. Specifically, those three languages, a trait Donovan was looking for during the early years of World War II, and later during The Cold War. Thomas’s life in the world of espionage began well before the CIA was formed. While we don’t know much about his role, it’s clear that Stansfield’s career dates as far back as the Second World War – when he was recruited by William Donovan fresh out of college. Donovan – who was the head of the OSS, the Office of Strategic Services, which was the first American intelligence gathering agency, and the predecessor of the CIA – sent the trilingual Thomas, as one of the Jedburgh team leaders, into Nazi-occupied Norway. Operation Jedburgh was a clandestine operation that combined military personnel from the United States, Britain, France, the Netherlands and Belgium – to parachute into Norway beginning around 1944. General Eisenhower would later say that the invasion of France would not have been possible without the brave Jedburgh teams, who, among other things, were responsible for feeding Intel, organizing the resistance forces, and disrupting the movement of German military troops. A young Stansfield was one of the agencies best, most productive agents in the fifties and sixties. In the late seventies, he was promoted to case officer. In the eighties, he was promoted again, this time by an impressed Ronald Regan, to Moscow Station Chief. Later that decade Thomas continued his climb up the career ladder when he became the Deputy Director of Operations, a position he held for many years. In fact, that’s his title in American Assassin, when he helps recruit a very young, unexperienced Mitchell Rapp. Sometime after the collapse of The Soviet Union, the CIA was spending large amounts of money on technology, mainly devices designed to gather intelligence, when it failed to inform the president of a national-security-crisis. Realizing there was nothing better than a perfectly placed spy, an actual man on the ground somewhere, the President assembled a task force to correct the shortcomings of the Central Intelligence Agency. Stansfield was part of this task force, and he recommended to the president that they increase the “human intelligence gathering apparatus on a global scale” – but cautioned that it would have to be a long-term commitment, and might bear no fruit for upwards of six to ten years. To his surprise, the President agreed with him fully. Not only did the president, who is only identified as “the previous President” in Term Limits, agree with Stansfield, but he made him Director of the CIA to oversee such efforts when Director Carlyle retired. Stansfield’s promotion was respected by most in Washington, and he was confirmed with bipartisan support. Arthur Higgins, the man Stansfield leapfrogged to become Director, plays a villainous role in Term Limits. It’s later revealed that Stansfield forced him to resign once he became his boss. Afraid Higgins wouldn’t go quietly, or that he’d sell secrets and blackmail the CIA, Thomas had plans drawn up to have him “neutralized” in the event that his worries should ever become a reality. Those plans were later used by Scott Coleman, his crew, and Michael O’Rourke, to grab Higgins from his home and interrogate him. Stansfield’s promotion to Director marked a first for the CIA, as the director position had never before been held by anyone that didn’t have a law degree, a military background, or a career as a politician. Stansfield was none of those things, and for the first time, a spy was running the world’s most famous spy agency. Like Stansfield, who was recruited fresh out of college in his early twenties, without any formal military experience, Mitch Rapp landed on the CIA’s radar during his junior year at Syracuse University. Thomas, seeking a way to take the fight to the terrorists on their land, founded the Orion Team – which was created to kill terrorists in a preemptive manner. He later passed it off to Irene Kennedy, who ran the team for many years. Rapp was her recruit, as she’s the one that found him, did his background research, and made contact with him in the winter months of 1988. His girlfriend, Maureen Elliot, had been on board Pan Am Flight 103 over Lockerbie, Scotland, when everyone on board was killed in a planned explosion. The act of terrorism caused a raging anger inside of Rapp, as well the deep desire to get revenge. That, combined with being a world class athlete and fluent in French, made him a perfect recruit for the Orion Team. Stansfield approved Kennedy’s request to bring Mitch on board, and ordered her to take him to Stan Hurley for his training. Though Hurley is reluctant to train Rapp, fighting Irene Kennedy tooth and nail over whether or not he’s qualified and right for the Orion Team, Stansfield is able to get Stan on board. Of course, it didn’t hurt that Rapp had bested Hurley in a sparring match just minutes after being dropped off at his lake house to begin his training. The only thing more bruised than Hurley’s face was his attitude, as the stubborn operative refused to believe he was wrong about Rapp. During a one-on-one conversation on his dock, under the stars, Stansfield was finally able to get thorough to Hurley. After Stan voiced his confusion over how Rapp got the better of him when he still beats ninety-nine point nine percent of the recruits that come through his door, even after he’s already trained them, Thomas lays it out for him. Stansfield is a supporting character in five novels – American Assassin, Kill Shot, Term Limits, Transfer of Power, and The Third Option – but is mentioned in every single book Vince Flynn wrote. That fact alone, that he’s mentioned in nine novels after his character dies, speaks volumes to his legacy and importance within the Rapp universe. Often when Stansfield is mentioned in later books it’s through the eyes of either Rapp or Kennedy, usually when they remember something he taught them – or to explain why they do things certain ways, because they picked it up from Thomas. Such is the case in Pursuit of Honor, where Stansfield is mentioned three times. Two of those times are in ways that pay tribute to something he taught them, like in chapter twenty – when it’s explained that Rapp doesn’t always just pick up a phone and call Kennedy to fill her in on things from the field. Stansfield’s lasting impact is again shown in chapter thirty-seven when Rapp gets out a pen and paper to make a list. He notes Kennedy’s disproval of this method, but has no choice since he lacks her photographic memory. Though Rapp remembers Thomas as “one of the finest men he’d ever known” in Pursuit of Honor, he cannot help but wonder if Kennedy tries too hard to be just like her mentor sometimes. Remembered for having a poker face that would make even the best professional card players jealous, Stansfield never reacted in a way that allowed his facial expressions or body language convey what he was really thinking. When Term Limits begins, Stansfield had been the Director of the CIA for four years. There’s about a year between then and the events of Transfer of Power, and six years between Transfer of Power and the ending of Kill Shot. So Thomas’s promotion to Director comes close to two years after Rapp was setup in Paris. His wife, Sara, passed away about a year after he became Director. A cancerous tumor had been found during a routine physical and when doctors went to operate, they discovered that the cancer had already spread to several lymph nodes. She died just two months later, a stretch that is referred to as “the hardest two months of Stansfield’s life” in Term Limits. Baring a crisis, Sunday’s were the one day Thomas took off each week. He typically spent his Sunday evenings at home with Sara, where the two would make dinner and watch 6o-minutes together before relaxing by the fireplace and enjoying a movie. Thomas and Sara had two daughters together. Sally, the oldest, lived in San Diego. Sue lived in Sacramento. Both were married and combined to give Stansfield five grandchildren. At the time of his death Thomas’s grandchildren ranged from seventeen years old, down to just five. At seventy-nine he was diagnosed with cancer. While doctors tried to convince him to have surgery, an operation that would have removed three-quarters of his liver, and radiation treatment, the old spymaster refused. He’d lived a long life, and missed his wife dearly. He was given six months to live, but that was quickly adjusted down to only a few weeks when his health detiriated faster than expected. Once Stansfield could no longer occupy his large office on the seventh floor of the CIA headquarters building in Langley, Virginia, a hospital bed was setup in the first floor study of his three-thousand-square-foot colonial home, which sat on two wooded acres overlooking the Potomac River. He died just two weeks shy of his eightieth birthday. While Stansfield had two biological daughters, according to The Third Option, he loved Kennedy like she was his third. Just before his death he’d made an arrangement with President Hayes for Irene to be named his successor. Even before approaching Mitch, who was considering leaving the agency, he wanted things in place for Kennedy to become Director. Since Rapp is the main character, it’s easy to think he is the most important asset to CIA, but that isn’t how Thomas felt. In fact, he thought of Irene as the most talented, and most crucial person to the spy agency. None of that downplays Rapp’s importance, it just speaks to the different roles that he and Kennedy play in protecting America. In regards to Rapp, Stansfield calls him the best operative he’s ever seen several times throughout the series, which is some darn high praise coming from a legend such as Thomas. Just as Bill Donovan passed his experience down to Stansfield, he in return passed his knowledge and experience onto Irene Kennedy. Helping to personally groom both her and Rapp, Stansfield left the CIA in wonderful hands for many years to come. Before his death he sat with Rapp and asked him to stay on with the CIA in some capacity for two reasons. He’s too good to walk away, and he wants Rapp to help protect Irene, whom he fears will be picked apart by his enemies once he’s in the ground. Rapp can’t bring himself to tell Stansfield no, so he accepts on the spot, giving Thomas a further sense of peace when he dies. His legacy is filled with honor, as he spent a lifetime working, often behind enemy lines, to keep America safe. His reputation lives on through Kennedy, who has adopted many of her predecessor’s traits. His recruitment of Rapp will undoubtedly go down as one of his greatest career accomplishments, along with his glory days in the OSS. Thomas Stansfield is a fascinating character and I wish we could have seen more of him. In fact, I’d really like to see a spinoff series detailing his early days in World War II and the OSS, before becoming one of the CIA’s first employees. I’m not sure that will ever happen, but it sure would be awesome if it did! In my mind, his greatest moment shown to readers comes in Transfer of Power. Vice President Baxter, who is acting Commander-in-Chief while President Hayes is unreachable in his bunker deep below the White House, which has now been taken over by terrorists, refuses to approve a military operation that could rescue the President and all the hostages. Stansfield goes on to ask Rapp to find the bunker, and disable whatever is jamming communications and preventing them from reaching the President. He then authorized Rapp to use whatever force necessary to get the job done. His plan was to get authority for the rescue operation from the President himself, bypassing Baxter. Stansfield trusted Mitch, and was brave enough to make the call alone, ensuring nobody else could face legal charges or discipline, had things ended badly. When it was all said and done, his plan worked, and President Hayes backed his decision and thanked him. His lowest point, though certainly nobody can blame him as he was near death – his body already badly wasted away from the cancer – came during one of his last trips to the White House. Stansfield, his voice tired and beginning to slur, failed to realize that Senator Hank Clark, who was busy sucking up to him, was the real evil mastermind behind all of the recent events. In the end, Kennedy and Rapp figured it out, and dealt with him the way Stanfield taught them – permanently. Thomas Stansfield was a legend in the world of espionage, and a legend in the Rapp universe. The opening scene of Separation of Power, when Kennedy stands over his freshly covered grave weeping, is one of the saddest in the entire series. His character is missed, but his spirit is alive and well – still protecting America though Kennedy, Rapp, and many others.